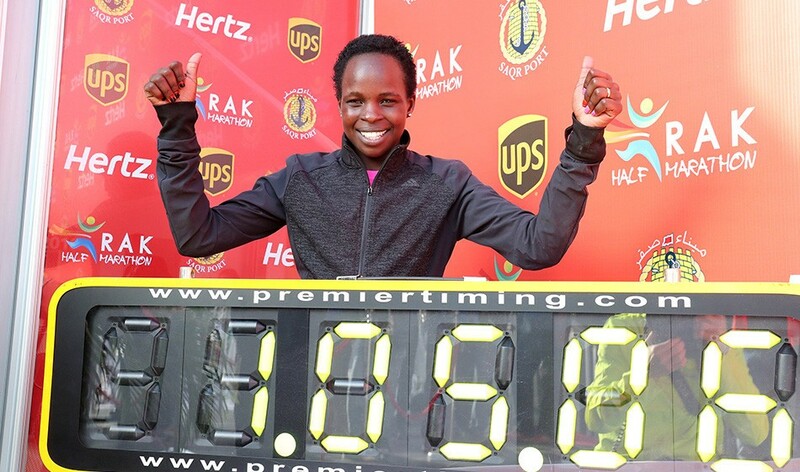 Two years after her world record-breaking run, Kenya’s Peres Jepchirchir will return to the Ras Al Khaimah Half Marathon on February 8, forming part of another strong women’s field. The 25-year-old clocked 65:06 in 2017 to take three seconds off the previous record and, having missed the 2018 season, is now back in action after becoming a mother. The world record was improved later in 2017 to 64:51 by Jepchirchir’s compatriot Joyciline Jepkosgei in Valencia, while Fancy Chemutai missed that record mark by just one second when winning last year’s race in Ras Al Khaimah during a memorable clash with Mary Keitany, who ran 64:55. With Joan Chelimo having run 65:04 in Prague last April, Jepchirchir now sits fifth on the world all-time list. Among those joining her to race in the northernmost emirate of the United Arab Emirates is Ethiopia’s reigning world half-marathon champion Netsanet Gudeta, whose win in Valencia last March gained her a first global gold and also improved the women’s-only half-marathon world record by 14 seconds to 66:11. Other entrants include Ethiopia’s world half-marathon championships fifth-placer Zeineba Yimer, 2015 world 5000m silver medallist Senbere Teferi, who will be looking to complete her first half-marathon race, and 66:47 half-marathoner Degitu Azimeraw. The men’s event also looks set for some fierce racing, with Ethiopia’s world cross country bronze medallist Abadi Hadis the quickest in the field with 58:44 clocked when placing third in Valencia last year. Two other sub-59:00 athletes will join him – Kenya’s Jorum Okombo, who ran his 58:48 in 2017, and his compatriot Alex Korio who clocked 58:51 in the same Copenhagen race. There are a total of 13 sub-60:00 performers in the field, including Kenya’s Daniel Kipchumba, Ethiopia’s Lelisa Desisa and Turkey’s Kaan Kigen Ozbilen. Julien Wanders broke the European 10km record with 27:32 in Durban in October and then improved it to 27:25 in Houilles in December, after running a European under-23 half-marathon record of 60:09 in February, and the Swiss runner could become just the fifth European athlete to break the one hour mark. The 13th edition of the Ras Al Khaimah Half Marathon will be staged partially on the new man-made Al Marjan Island complex, which organisers describe as “possibly an even faster circuit than in previous years”. Race day also includes a mass-participation half-marathon which is said to have received larger entry numbers than ever before.